Warning: This video contains graphic content that may be hard to watch for some viewers. Warning: The video above contains graphic content and may upset some viewers. 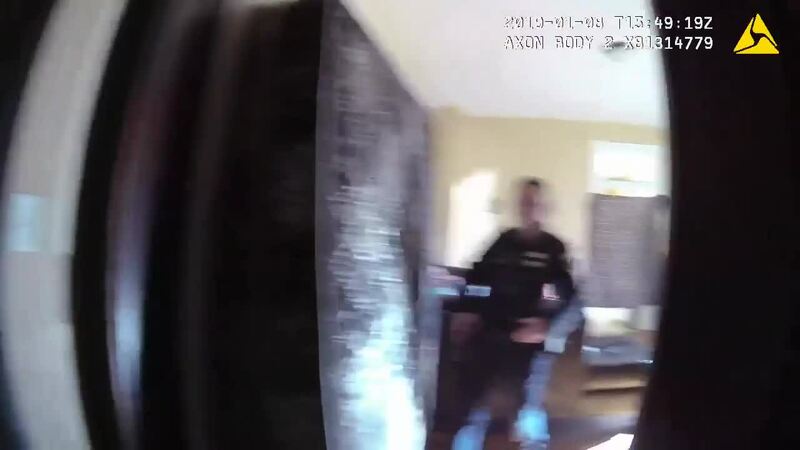 LAFAYETTE — The Lafayette Police Department released the body cam video from the officer who accidentally shot a fellow officer in the back while serving a warrant earlier this week. The police review board has determined that the shooting was accidental. Lane Butler, a three-year veteran of the department, remains in serious, but stable, condition at Franciscan Health Lafayette East. Police said Butler was shot in the back after another officer accidentally discharged his weapon when a dog jumped on him during a criminal mischief investigation. The incident happened just before 11 a.m. in the 800 block of N. 9th Street. During the course of their investigation, officers received information about a person who was wanted at the same location they were responding. While investigating, a police say a large, aggressive dog charged the officers and one of them discharged their weapon. That bullet struck the other officer in the back. Lafayette police say a review board has determined that the shooting was "accidental" and the officer involved, Aaron Wright, will not be terminated. You can watch the full press conference with Lafayette Police below.